DeWalt DCK240C2 vs DCK280C2 which Dewalt drill/impact driver combo is best? 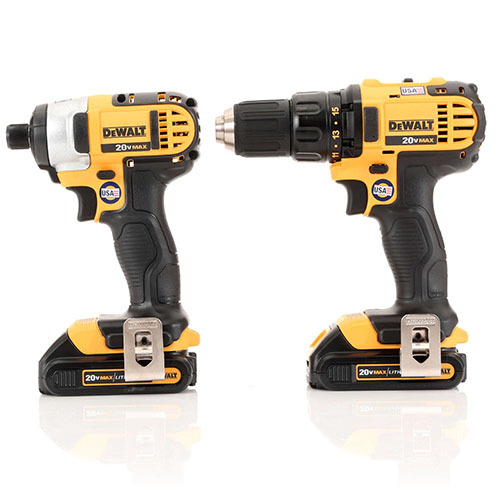 ​In the market for a new impact drill/driver kit? Of all of the leading manufacturers DeWalt has got you covered. It has numerous offers along with the other big names such as Makita, Porter Cable and Milwaukee. When it comes to power tool combo kits the DCK240C2 and DCK280C2 are a great entry level choice for those in need of a cordless combo kit. Both kits are fairly similar at first glance. Lets take a brief look at each and then make the comparison with a final decision below​. The DeWalt DCK240C2 combo kit includes the DCF885 impact driver and the DCD771C2 drill/driver. Weighing roughly 2.8 pounds the DCF885 is easy to maneuver in small spaces and can be used for extended periods without too much fatigue in the arms/shoulders when working over head. Included on the DCF885 is a strong 3 LED light ring that focuses on the work surface whilst casting a minimal shadow. The LED is also delayed ​by 20 seconds so for sort bursts it won't come on. ​There is also a handy belt hook included on the DCF885. The DCD771C2 is a 20 volt Lithium-Ion compact drill/driver. It has a two speed transmission that has settings of 0-450 and 0-1,500 RPM. The chuck​ on the DCD771C2 is 1/2 inch single sleeve ratcheting. Included in the kit is a single 20-Volt Max charger and ​2 20-Volt Max lithium-ion 1.3Ah battery packs. There is also a hard wearing contractor bag for transport/storage. The DeWalt DCK280C2 combo kit contains the DCD780 drill/driver and the DCF885 impact driver. Everything on the DCF885 impact driver is the same as discussed above. The DCD780 drill/driver​ is a step up in power and speed from the DCD771C2 found in the DCK240C2 combo kit above. The faster DCD780 also has a two speed transmission that allows users to operate at either 0-600 RPM or 0-2,000 RPM​. Power output is beefed up a little to 350 UWO. The two battery packs with the DCK280C2 ​are 1.5Ah and there is a 30 minute fast charger included. ​DeWalt DCK240C2 vs DCK280C2 which should you buy? The difference as outlined above between the DeWaltDCK240C2 and DCK280C2 is the drill/driver. The DCD771C2 is a little heavier, slower, less powerful and the batteries in the kit have a lightly shorter run time than those found in the DCK280C2. If you are on a very strick budget then the DCK240C2 is still a pretty good combo kit. However for a few more bucks you can get a much better version of the drill plus the longer battery life of those found in the DCK280C2. Biscuit Joiner vs Domino – Which is Best? Copyright text 2017 by Woodworking Tool Guide. Woodworking Tool Guide is a participant in the Amazon Services LLC Associates Program, an affiliate advertising program designed to provide a means for sites to earn advertising fees by advertising and linking to Amazon.